Molti egualitari, tra cui i "libertari reali" come Van Parijs, affermano di voler valutare le distribuzioni della liberta tenendo in conto "l'intero arco della vita" di ciascuna persona. Qual e l'esito prescrittivo di un tale atteggiamento normativo: il reddito di base (un reddito erogato a intervalli regolari durante l'intero arco della vita) oppure il capitale di base (una somma erogata una volta sola, all'inizio della vita da adulto, che la persona puo distribuire come sceglie lungo l'intero arco della propria vita)? La prima risposta dipende da una interpretazione "a stato finale" del riferimento all'intero arco della vita; la seconda dipende da una interpretazione "a blocchi di partenza" di tale riferimento. In base a una concezione riduzionista della persona (dovuta a Derek Parfit), e a un'idea particolare di rispetto per le persone (chiamata "rispetto opacita"), e possibile giustificare una combinazione di queste due interpretazioni, e con cio la prescrizione libertaria di una combinazione di capitale di base e reddito di base. I am grateful to Axel Gosseries and Hillel Steiner for comments on a previous draft of this essay. I expand somewhat on the theoretical proposal contained in this essay in a working paper entitled ”Equal Opportunity, Equal Freedom, and Equal Respect for Persons”, forthcoming in the HDCP-IRC Working Paper Series, Institute for Advanced Study, Pavia, ISSN 1974-1952. I firmly believe that a society of really free people could not countenance a crowd of elderly destitutes who are paying a heavy price for squandering their one-off basic endowments decades ago. 1 Van Parijs 1995: 31. Long runs are made of short runs – to ignore the latter is very foolish. 1Assume that egalitarian justice requires us to accord each person a certain amount of freedom – perhaps an equal amount of freedom. At certain stages in their lives, people exercise their freedom in ways that affect how much freedom they enjoy at later stages of their lives. How, if at all, should egalitarian justice take account of this fact? Basic income or basic capital? 2Philippe Van Parijs has wrestled with this thorny question. His own inclination is to say that real freedom for all is guaranteed through (among other things) the allocation of a universal basic income, provided in regular equal instalments (say, monthly instalments) over the course of each person’s life. But why, he asks, should we not favour assigning a person the whole of her basic endowment at the beginning of her life? The latter alternative, commonly called ’basic capital’, would give the person exactly the same freedoms as those guaranteed by the basic income (assuming she has the freedom to invest the capital), plus other freedoms, such as the freedom to spend the capital at a young age on an expensive cosmetic operation or a flashy sports car. And yet, can a ’really free society’ countenance the possibility of a crowd of elderly destitutes who in their youth blew their entire basic endowment on flashy sports cars (or, more nobly, on helping elderly destitute people)? Under a regime of equal basic capital, the enforced redistribution of resources in favour of elderly destitutes would unjustly penalize those who, having enjoyed (no more than) an equal right to initial freedom, gave more prudent consideration to the degrees of freedom enjoyed by their later selves. 3Van Parijs briefly contemplates the following possible justification for preferring basic income over basic capital: we could take a sceptical attitude toward the continuity of persons over time, so that my later selves should be seen as enjoying distinct entitlements to freedom – entitlements which they hold against my earlier selves no less than against other people. He rejects this alternative, however, given that it clashes with the temporal unity of the self that seems to provide the very reason for taking an interest in people’s freedom in the first place. The reason a ’real libertarian’ considers freedom (rather than, say, welfare) to be the relevant distribuendum, is that libertarians respect persons: they consider persons as setters of ends and as makers of plans, including plans that extend well into the future and indeed over the whole of the rest of their lives (Van Parijs 1995: 47). Slicing persons up temporally is not the best way to respect their integrity as temporally unified setters of ends and makers of life-plans. 4Van Parijs’s own solution to this problem is not to question the temporal unity of persons or the importance of life-plans, but instead to adopt ’a mildly paternalistic concern for people’s real freedom throughout their lives’, on the assumption that people have an interest in protecting their freedom at older ages ’against the weakness of their will at younger ages’ (Van Parijs 1995: 47). This solution is unsatisfactory, however, because the assumed temporal unity of persons, combined with our respect-based reason for being interested in their freedom, makes it difficult to justify paternalism. By explicitly embracing paternalism (however ’mild’), Van Parijs effectively admits defeat in the search for a ’real libertarian’, respect-based justification for his preference for basic income over basic capital. 5In what follows, I shall gesture in the direction of a solution to Van Parijs’s problem. To show why that solution is necessary as well as possible, I must first introduce some technical distinctions. 6The concern of Van Parijs, and of many other egalitarians, is with the freedom people enjoy over their whole lives. But what is it, exactly, to enjoy freedom ’over one’s whole life’? The answer to this question is complicated by the fact that freedom necessarily pertains to the future. Indeed, unlike in the case of other possible distribuenda (such as welfare or resources), any ascription of freedom includes, at least implicitly, two time indexicals: the time at which the freedom in question is enjoyed by the agent, and the time of the occurrence the agent is free to bring about (Carter 1999: ch. 7; Kramer 2003: 76-91). For example, I am free now, at the time of writing, to leave my study in one hour’s time (for it is true now that, were I to try to do so in one hour’s time, I would not be obstructed). Suppose, however, that someone were to lock my study door from the outside right now, for a period of two hours. Then we should say that I am unfree right now to leave in one hour’s time, but am free right now to leave in three hours’ time. 7An explanation of what it is to enjoy ’freedom over a whole life’ might involve aggregating over either or both of these two temporally specific phenomena: the freedom enjoyed, and the hypothetical actions. Thus, we can distinguish two different conceptions of ’freedom over whole lives’. I shall call these the ’starting-gate conception’ and the ’end-state conception’. On the starting-gate conception of ’freedom over whole lives’, the amount of freedom you enjoy over your whole life is identical to the amount of freedom you enjoy at the beginning of your life. Although this claim might at first seem surprising, it immediately gains plausibility once one considers that it is only at the beginning of one’s life that one’s future coincides with the whole of one’s life. Each person begins life with a tree of spatiotemporally specific action possibilities, branching out through all of the many alternative possible lives the person is free (at the beginning of her life) to lead. On the starting-gate conception, the freedom one enjoys over one’s whole life is calculated as an aggregation of the set of (spatiotemporally specific) actions one is free (at the beginning of one’s life) to perform. On the end-state conception of ’freedom over whole lives’, by contrast, we need to consider each and every one of the different amounts of freedom possessed at various moments extending over a single life. 3 See McKerlie 1989, and subsequent articles. 8When we aggregate over the (spatio-temporally specific) actions a person is free at time t to perform, we produce a judgement of the degree of overall freedom enjoyed by that person at time t. Both of the above conceptions of ’freedom over whole lives’ aggregate over whole lives in the sense of aggregating over available actions. It is also conceivable, however, that one might aggregate over the degrees of freedom possessed at various times during a person’s life. Call an aggregative end-state conception of ’freedom over whole lives’ a conception according to which the concern for a person’s freedom ’over her whole life’ amounts to a concern for the sum or the average of all the degrees of freedom possessed by her at various given junctures extending over her whole life. This conception coincides with what Dennis McKerlie and others have called a ’complete lives view’.3 But an end-state conception of ’freedom over whole lives’ might be aggregative or non-aggregative in the above sense, for one can still be said to be concerned with the freedom people enjoy ’over their whole lives’ if one says, for example, that a person has a right, at any one time in her life, to enjoy a degree of freedom that is equal to the freedom enjoyed by others at that same time. (The latter conception coincides with what McKerlie calls the ’simultaneous segments view’.) The starting-gate conception, on the other hand, is necessarily non-aggregative with respect to temporally distinct degrees of freedom. 10Leaving aside the difference between aggregative and non-aggregative end-state conceptions, the different conceptions of ’freedom over whole lives’ can be represented graphically as follows, where the arrows pointing from left to right represent the passage of time. Which conception is the most appropriate? 11Fine-grained as they are, the above distinctions are important: if one intends to argue from a concern for ’the freedom people enjoy over their whole lives’ to the prescription of basic income or of basic capital, one must first specify which conception of ’freedom over whole lives’ one is assuming. The choice of conception will influence the resultant prescription. In order to avoid presenting a circular argument, one’s choice of conception must be grounded independently of one’s preference for basic income or for basic capital. 12Consider first the two alternative versions of the end-state conception. The discrete-segment version is the simpler of the two, but it is also the less plausible one. After all, the real degree of a person’s freedom at any given time surely depends on her freedom to bring about events that are temporally located at any subsequent time within her expected lifetime. Focusing at t1 only on those freedoms to perform actions located between t1 and t2 seems plausible only if we think of the life of the person under consideration as itself coming to an end at t2. 13The discrete-segment version therefore seems to presuppose scepticism about the temporal continuity of persons over time, and this fact seems to constitute an independent reason for rejecting the discrete-segment version. Moreover, such scepticism seems to be subversive of our reasons for being interested in interpersonal distributions at all. As Derek Parfit suggests, to the extent that we weaken the unity of the self over time, not only do we extend the scope of our distributive principles (so as to cover distributions among selves located within discrete temporal segments of a single biological life); we also lessen the weight that those principles ought, intuitively, to have in our moral thinking. Weakening the unity of the person over time lessens the importance of the very separateness of persons that occasions our interest in interpersonal distribution rather than aggregation (Parfit 1984: 113-114). As a result, an aggregative end-state conception of ’freedom over whole lives’ will start to look more appropriate than a non-aggregative end-state conception, and the scope of the aggregation will be interpersonal as well as intrapersonal. Even if we can somehow justify a continued interest in people’s freedom (as opposed to their welfare), the appropriate ethical principle will then become maximal societal freedom, rather than equal freedom or leximin freedom. 14At this point, however, it is not clear why we should endorse an end-state conception at all. Our reason for rejecting the discrete-segment version depends on our belief in persons as temporally unified wholes. This belief occasions our interest in the freedom they enjoy over their whole lives. The starting-gate conception is a conception of ’freedom over whole lives’, and it is surely this conception, rather than the fresh-starts end-state conception, that is most consistent with the idea of respecting persons as temporally unified wholes. Yet the starting-gate conception will lead us to prescribe basic capital, not basic income. 15A respect-based justification for basic income might nevertheless be found in a more nuanced approach to the problem of personal identity. On Parfit’s reductionist view, there is no ’further fact’ of personhood beyond a series of physical and psychological states that are more or less connected with each other over time. Nevertheless, those states are (more or less) connected. 16Adopting a reductionist conception of persons need not, then, lead us to jettison the liberal idea of respect for persons. Even on the reductionist view, persons remain setters of ends and makers of plans, including plans that extend over the whole of the rest of their biological lives. Just as the ethical ideal of respect for persons has survived the transition from a Kantian transcendental conception of the person to a naturalist conception, so too it can survive the transition from a non-reductionist conception of the person to a reductionist one. A person’s agential capacities can, at any one time, remain an object of respect, and that person can accordingly be conceived as the bearer of an entitlement to freedom. 17Elsewhere I have developed a particular interpretation of respect for persons, which I have called ’opacity respect’ (Carter 2011). When combined with a reductionist view of persons, this interpretation of respect might motivate an understanding of ’freedom over whole lives’ that gives some weight both to the starting-gate conception and to the end-state conception. 5 On the idea of a range property as the basis of equality, see Rawls 1971: sec. 77. 19A similar attitude might be appropriate with regard to people’s different degrees of psychological connectedness. On a reductionist view of persons, psychological states tend to exhibit a minimum of connectedness. Perhaps, then, respect for the dignity of persons (considered as makers of plans, including life-plans) becomes appropriate not only when they exhibit a certain minimum of agential capacities at any one time, but also when their several temporally distinct psychological states exhibit a certain minimum of connectedness. And perhaps that respect ought to lead us to abstain not only from evaluating degrees of agential capacities (above the minimum) but also from evaluating degrees of connectedness (above the minimum). 20If we assume opacity in terms of degrees of connectedness over time (above the given threshold), the way in which the entitlement to freedom is allocated over time will be the same for all, and will depend on the appropriate conception of ’freedom over whole lives’. Which conception of ’freedom over whole lives’ will be the appropriate one? Despite our refusal to assess degrees of connectedness, we all know that agents are not perfectly unified wholes, and that the individual states to which they are reducible are not always perfectly connected. This knowledge suggests that we should give some weight to the end-state conception. However, the commitment to opacity respect will have two further implications that ought to save us from the unwelcome consequences outlined in the previous section. 21First, it will lead us to adopt the fresh-starts version of the end-state conception, rather than the discrete-segment version: at any given time, we shall respect each person as falling within the normal range of connectedness, and therefore as a potentially effective decision-maker for the future selves that extend over the whole of what remains of her biological life. In other words, we shall respect (normal) people’s capacities to make life-plans regardless of their actual or expected degrees of connectedness to their future selves. Second, it will lead us to retain our commitment to the separateness of persons as they are normally understood, and with this our commitment to the interpersonal distribution of freedom (as opposed to its societal maximization): given our respect for persons as potentially effective decision-makers for their future selves, we ought to treat each temporal sequence of minimally connected selves as separate from other such temporal sequences and therefore as the bearer of a separate entitlement to freedom. 22The upshot of this reasoning might be the combination of a first principle prescribing the greatest equal freedom over whole lives, assuming the starting-gate conception of ’freedom over whole lives’, and a second principle prescribing a guaranteed minimum of freedom over whole lives, assuming the fresh-starts end-state conception of ’freedom over whole lives’. The second principle could be seen as constraining the maximizing element of the first. 23Depending on the level at which we feel warranted in fixing the minimal threshold of connectedness – depending, that is, on how high we can fix that level without excluding persons who are generally seen as ’normal’ – the resultant freedom allocation might yet turn out to be closer to basic capital than to basic income, even though the policy of pure basic capital will never be appropriate. At one extreme, for example, it might consist in a first instalment at the beginning of people’s adult lives together with a second instalment at the age of retirement. CARTER, I. (1999), A Measure of Freedom, Oxford: Oxford University Press. CARTER, I. (2011), ’Respect and the Basis of Equality’, Ethics, 121 (3): 538-571. FLEURBAEY, M. (2005), ’Freedom with Forgiveness’, Philosophy, Politics and Economics, 4: 29-61. KRAMER, M.H. (2003), The Quality of Freedom, Oxford: Oxford University Press. McKERLIE, D. (1989), ’Equality and Time’, Ethics, 99 (3): 475-91. NOZICK, R. (1974), Anarchy, State and Utopia, New York: Basic Books. PARFIT, D. (1984), Reasons and Persons, Oxford: Clarendon Press. VAN PARIJS, P. (1995), Real Freedom for All. What (if anything) can justify capitalism?, Oxford: Oxford University Press. 4 I take the term ’fresh starts’ from Marc Fleurbaey (2005: 29-61). The fresh-starts version of the end-state conception is like the starting-gate conception inasmuch as it involves positing several starting-gates over the course of the agent’s life. Nevertheless, I classify it as an end-state conception because any principle of justice based on that conception would count as an end-state principle in the standard Nozickian sense (see Nozick 1974: ch. 7. Ian Carter is Associate Professor of Political Philosophy at the University of Pavia, Italy. He is the author of A Measure of Freedom (Oxford U. P., 1999) and La libertà eguale (Feltrinelli, 2005). He recently edited Freedom: a Philosophical Anthology (Blackwell, 2007, with M. Kramer & H. Steiner) and Hillel Steiner and the Anatomy of Justice (Routledge, 2009, with St. de Wijze & M. Kramer). He is a member of the editorial boards of Economics & Philosophy and J. of Applied Philosophy. CARTER, Ian. Distributing freedom over whole lives In : Arguing about justice : Essays for Philippe Van Parijs [en ligne]. Louvain-la-Neuve : Presses universitaires de Louvain, 2011 (généré le 22 avril 2019). Disponible sur Internet : <http://books.openedition.org/pucl/1790>. ISBN : 9782875581969. Carter, Ian. “Distributing freedom over whole lives”. Gosseries, Axel, et Philippe Vanderborght. 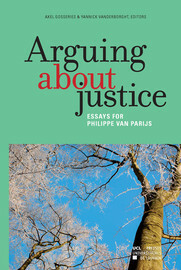 Arguing about justice : Essays for Philippe Van Parijs. Louvain-la-Neuve : Presses universitaires de Louvain, 2011. (pp. 135-143) Web. <http://books.openedition.org/pucl/1790>.